When many people want to understand the side effects of a medication, or to diagnose a new pain or rash, the first line of inquiry for medical advice is a doctor named Google. Many—if not most—of those searches end up on Wikipedia. The online encyclopedia has 25,000 medicine articles, seen by 200 million people per month. Wikipedia is a more popular source of health content than the NIH, WebMD, Mayo Clinic, and others (source). Nearly 8,000 pharmacology articles are accessed 40 million times. 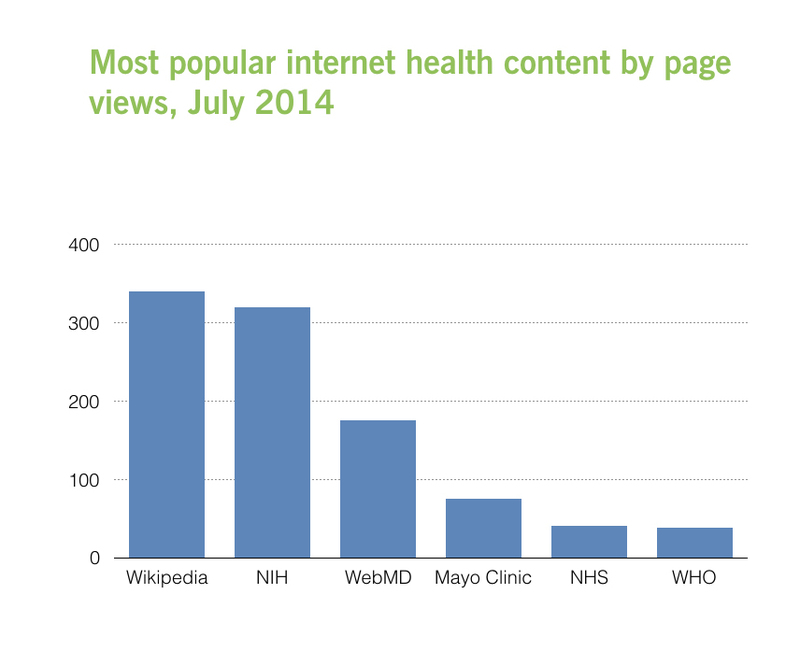 Globally, medical information on Wikipedia earned a staggering 4.8 billion page views in 2013. In the US alone, Wikipedia’s health-related searches outnumbered websites such as the NIH, WebMD, and Mayo Clinic. It’s not just patients. Wikipedia was described as “the leading single source of healthcare information for patients and healthcare professionals” in 2014. For better or for ill, people are turning to Wikipedia for medical advice. That’s inspired a lot of hand wringing from the medical community. What can be done? Dr. Amin Azzam, a professor of psychiatry at the UC-San Francisco School of Medicine, spotted an opportunity. He’s pioneering a novel solution suggested to him by former students: assign medical students the task of improving medical articles on Wikipedia. These students learn communication skills essential for any practicing health professional, and they improve the public’s access to reliable, accurate knowledge about health and disease. The results of the first three cycles of Dr. Azzam’s Wikipedia-editing medical school course will be published later this year in a top-tier medical education journal. The impact: the medical articles tackled by just 28 students were seen 975,000 times during only the times students were actively editing. Those students objectively improved the level of information found there. The manuscript examines outcomes based on WikiProject Medicine’s quality scale, as well as a review by a panel of UCSF-affiliated MD’s. Dr. Amin Azzam discusses his use of Wikipedia with students in 2015. The course adds an element that would otherwise be missing from Wikipedia medical editing: the oversight by experts, trained in medicine, channeled into improving Wikipedia. 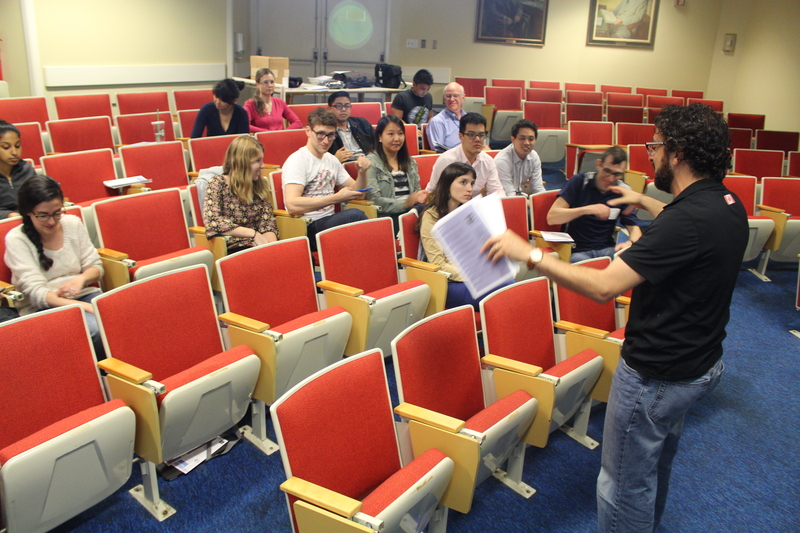 Working with fourth-year medical students, Dr. Azzam assigns his students Wikipedia articles from a list of the 100 most-read articles, as defined by WikiProject Medicine, a crucial partner for the course. Dr. Azzam sets students to work on fact-checking an article’s content, and adding sections that are missing. This term, all seven of his students collaborated on a single article: hepatitis. It’s hard to imagine a better classroom for this type of assignment. It’s their final year of medical school, so these students are well versed in the foundational sciences of medicine. They have all passed the first part of the medical licensing exams, and many have passed the second. All of them have been rotating through different parts of hospitals and clinics, such as internal medicine, surgery, pediatrics, psychiatry, family practice, and obstetrics/gynecology. “As a result of all this training, my medical students are well-qualified to be improving the medical and health-related content on Wikipedia pages,” said Dr. Azzam. The impact on English Wikipedia is massive. But the project has expanded further through a partnership with Translators Without Borders. That group translates the top 100 medical articles into 100 languages. That means the student’s work on Wikipedia has an impact on global access to health information. When it started, Dr. Azzam admits that even he was skeptical. But this month, he and his co-authors of a paper about the course have been awarded the UCSF Academy of Medical Educators Cooke Award for the Scholarship of Teaching and Learning. That’s a reflection of a broader trend: Wikipedia’s increasing acceptance in medicine and academia. The Wiki Education Foundation, which supports Dr. Azzam’s course at UCSF, has been working with hundreds of classrooms across the United States and Canada. We’ve seen warming relationships between academia and Wikipedia, such as our partnership with the Association for Psychological Science. Just as academics have warmed to Wikipedia’s role in a classroom, medical experts have warmed to Wikipedia. A major turning point was Wikipedia’s remarkable article on Ebola during the 2014 outbreak. This page was successfully updated through the efforts of WikiProject Medicine, which monitored the page. This may have been the public’s first exposure to how medical content gets onto Wikipedia in the first place. There’s still a sense that Wikipedia gets edited willy-nilly by anyone with a mouse to click on and a keyboard to peck at. That’s simply not the case. Edits on the highest-traffic articles require proposals to a Talk page, independent of the main article. All content must be cited to a reliable and credible source of information. These citations are held to strict academic standards, and will get quickly deleted if they don’t pass muster. This process is exactly why medical editing is a valuable learning experience for seasoned students in small settings, with dedicated supervision by an expert. The students are flexing their academic muscle when they propose edits for inclusion, select sources, and assess existing content. It’s also a great chance to practice the invaluable skill of explaining complicated medical topics to a general audience. This is where those weaknesses come into play. Nguyen agreed. She sees it in her own family’s curiosity about medicine, despite their lack of training. Communicating medical information to patients in a meaningful way, she said, was a difficult, but important task. “The most interesting part of this for me has been looking at these articles with a critical eye and attempting to translate our medical knowledge into something accessible,“ said Nguyen. Dr. Azzam said one of the best way for other medical instructors to get involved is through a partnership with the Wiki Education Foundation. He also emphasized the value of working with a university librarian, or, for that matter, working with him. The Wiki Education Foundation is proud to be collaborating with Dr. Azzam to produce a series of videos that help classrooms access, assess, write, and peer-review health-related content on Wikipedia. Our goal is to make it easier for more courses like Dr. Azzam’s to contribute high-quality medical content to Wikipedia. That project folds perfectly into our Year of Science initiative, aimed to make improvements across Wikipedia’s science coverage, and improve the quality of open knowledge that anyone can access. We know students benefit, too, by considering the best way to share their own knowledge with the general public. That means better, clearer, and more accurate medical information, too. If you’d like to get involved with a similar Wikipedia assignment for your classroom, let us know. Reach us at contact@wikiedu.org. Image: Modified from Noun project 579.svg by Jack Biesek, Gladys Brenner, Margaret Faye, Healther Merrifield, Kate Keating, Wendy Olmstead, Todd Pierce, Jamie Cowgill and Jim Bolek – The Noun Project, CC0.